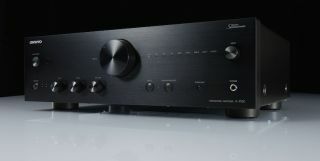 Onkyo unveils new A-9150 stereo amplifier | What Hi-Fi? This integrated amp has four RCA line-level inputs, two coaxial and two optical digital inputs, and gold-plated speaker posts. Oh, and a 32-bit/768 kHz DAC. Refinements to the power amp, two custom-made audio capacitors and a 32-bit/768 kHz AK4452 DAC: these are the features Onkyo is hoping will help sell you its new A-9150 stereo amplifier. You get four gold-plated RCA line inputs and two gold-plated coax ins, two optical digital inputs and gold-plated speaker posts with an A/B selector for switching between two pairs of speakers. There's also a gold-plated MM/MC phono input, so if you're been riding the wave of the vinyl revival you can rest assured your turntable will be catered for. Onkyo has also tried to improve the slew rate (the maximum rate at which an amplifier can respond to an abrupt change of input level) to " significantly improve instrument definition and placement". This is via its Discrete SpectraModul, rather than conventional IC chips. Whether this will result in great sound remains to be heard, but if you don't want to wait for our review (you impetuous thing) the A-9150 will be available next month. It's priced at £500.